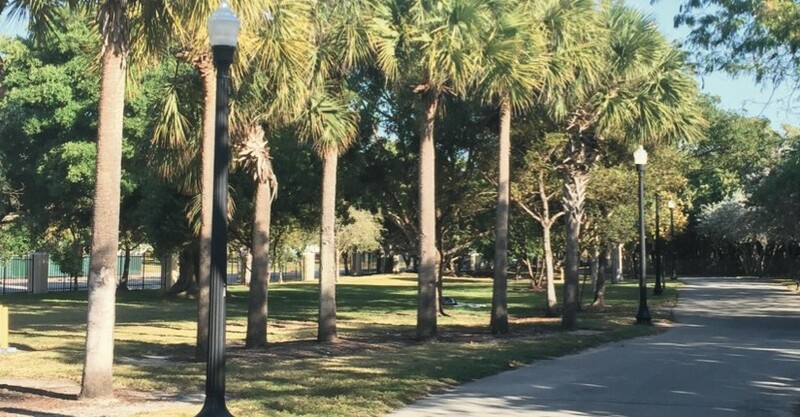 The City of Miami Beach's plans to redesign North Shore Open Space Park got the go ahead today from the Design Review Board (DRB) with conditions to come back with more definitive plans for fencing, location of the playground, and a discussion on lighting. City consultant Gianno Feoli, Director of Landscape Urbanism for Calvin Giordano & Associates, told the DRB the design emphasizes the greatest areas of interest and concern raised by the City and community: security, connecting the beachwalk, and maintaining the trees and other vegetation. Spanning the area east of Collins from 79th to 87th Streets, the project includes completion of the beachwalk, meandering walkways, conservation areas, defined gateways, and a new playground. As he has done in other public meetings, Feoli discussed plans to break up the clusters of sea grapes and spread them throughout the park, creating more visibility and increased safety as well as more diversity in the conservation areas. By installing new pods of seagrapes, the coverage will expand from 5.63 acres to 6.43. And, he said, while some trees will be removed, primarily due to damage and other unsafe conditions, there will be a net gain of 217 trees in the park. Feoli and City staff asked the DRB for guidance on plans to create a barrier around the park as requested by the City of Miami Beach Police Department. Currently, there is an old black "estate fence" interspersed between large block columns. After community input asking for something "less jail like", the planners suggested cutting the fence down to two feet in height, capping it, and putting a hedge in front of it. Due to cost, they suggested leaving the columns as is. While a lower fence and hedge could still be traversed, City staff indicated what the Police Department most needed was a barrier so that if someone was caught inside the park after hours, they could be charged with trespassing. The height of the barrier doesn't matter, they said, just the fact that there is one. Paula King, representing the North Beach Neighborhood Association, said her group would prefer to remove the fence entirely and keep it open to the public. The Board, however, agreed with staff that fencing was necessary, not only to satisfy the request of the Police Department but also to create a barrier between the park and traffic on Collins Avenue. They suggested trying to remove the columns to create a "less linear edge." King also expressed dismay over plans to keep the old "Victorian style" lighting in what will be a new park. David Gomez, Miami Beach Senior Capital Project Coordinator, said the old lighting is being kept inside the park for regulatory reasons. If the City were to replace the lighting, it would need to be turtle friendly. While new turtle friendly bollard lighting will be added on the beachwalk, the bollard lights do not provide enough lighting for safety inside the park. King urged the City to find new turtle friendily lighting options that could be used. Gomez added a comprehensive lighting plan is being developed for the entire City and the park could be included in that. DRB members asked for further details on when the plan might be ready and how it would apply to the park. Finally, Feoli asked for guidance on two options for the location of the playground, the first being closer to one of the conservation areas and the second in one of the more open green spaces. Residents had expressed concern about the safety of a play area next to a cluster of sea grapes which could create blindspots. Feoli said he believes once the sea grapes are trimmed up to create lines of visibility this will not be an issue but asked the DRB for its thoughts. As to the second location, he said it will increase the cost due to necessary regrading of the area. Board members expressed uncertainty at this point though one member suggested giving up the open green space may not be the most desirable option. They asked for further discussion once plans evolve more. As of now, schematics are about 30 percent complete. Earlier in the week, the Parks and Recreational Facilities Advisory Board also approved the plan for the park while expressing its desire to see more work on the proposed fencing. The Advisory Board recommended a fence lower than the one that is there now "with a wavy artistic design at the top and a low maintenance hedge or shrubbery along the bottom to soften the look." The City received $10 milliion from David Martin, President of Terra Group which is developing the adjacent Eighty Seven Park luxury condo building. $6 million of the money is earmarked for North Shore Open Space Park.